Total General Aviation Flying Hours[i] (which excludes sport aircraft and Airline Transport) are almost static as to actual hours but in decline compared to population. 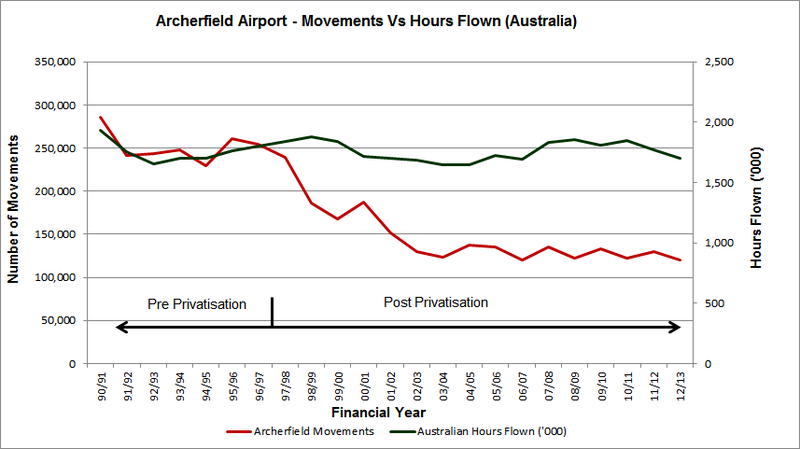 Archerfield Airport’s movements[ii] are now only 47% of pre-privatisation levels. The loss has been a 53 % decline post airport privatisation, that is 134,336 movements per annum down from pre-privatisation levels. A classic example of that is, in relation to airports, the failure of successive governments to implement the statutory provisions of the Airports Act 1996 and the Airport Sales Agreements –including the Commonwealth leases and the Sale Transfer Instruments. very high rental increases which cannot be afforded by the industry that are leading to the destruction and closure of general aviation business being irreplaceable losses to the industry. The Chamber Stated “the secondary airports in Australia form the nodal points, the very heart of general aviation in this country being the advanced centres of aviation technology and knowhow and the gateway to the regions. They must be allowed to function efficiently as public utilities not private fiefdoms of property developers. The aviation industry is impatient for these impediments to be addressed and fails to see why some of the readily apparent and easily tackled failings have not been dealt with. The Minister therefore should as a matter of great urgency abandon the Light hands policy and endorse the establishment of an Airports Review Tribunal. Given the Federal Attorney General’s 13th May 2014 media announcement to merge all the Federal Review Tribunals, now is the time to implement it. Archerfield Airport Chamber of Commerce Inc.